DYR Demo with be from 5 pm-6 pm on Friday, March 15th! Come on out and see us!! You can also visit us at our booth all week-end! 3-day overnight camp, boys and girls welcome! ​Click the "Register Now" button below to sign up electronically for any upcoming events. fill these forms out yearly (as of the 1st of each year). Please contact us with any Qs! Day Camps cost $50 per camper per day. Overnight Camps cost approximately $125 per camper. Weekend Retreats currently cost $75 per person. ​per session, but it is not required to attend. More info is located [here]. You must register online for all DYR events. Please contact us regarding scholarship opportunities. Please click on the links below to find out more about our speakers for 2019! Hope to see you soon! Bruce Van Natta is the founder and president of Sweet Bread Ministries. He is a common, everyday person that serves the Living God who is anything but ordinary. His journey from prodigal son to full time ministry stretched out over three decades before culminating in a display of God’s power and grace. Starting at an early age in Bruce’s life, the Lord proved Himself faithful repeatedly, despite tragedies, countless bad choices, and decisions made by Bruce. After high school, the Lord called Bruce into ministry, but instead of being obedient he ran away and chose his own path, which led to more problems and addictions. ​Bruce wrote the book Saved By Angels which is available at most book stores and on the net. Since recovering from this accident, he and his family have gone into full-time ministry sharing their gripping testimony wherever the Lord leads. They have felt led to not only minister to the body of Christ but also to those in need, resulting in building an orphanage in Honduras and a church in India with home equity as well as doing prison and jail ministry. 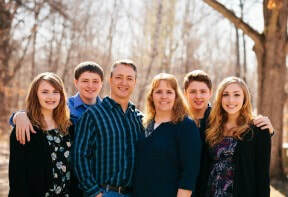 He, his wife Lori, and their four children--Lauren, Caleb, Jacob, and Emily--live in Wisconsin. Georgette has an amazing personal testimony and has been active with outreach efforts to Native Americans in need. She is a very gifted speaker with a gentle heart and a love for all of God's children. "We partner with Christian organizations in leading meaningful worship experiences which both bring people to Christ and nurture that lifelong relationship. We work with churches, schools, camps, retreats, and any other Christ-centered organization. Our Team is made up of gifted speakers, and praise and worship leaders who are committed to serving the Lord while serving others. Happy the Dog’s official Bible verse for the ministry is Acts 4:20 - 'As for us, we cannot not keep quiet about the things we have seen and heard.' We would love the pleasure in joining with you in 'not keeping quiet'." Dave and Patty are the founders of Holy Spirit Led Ministries of Ankeny, Iowa.​ Dave Lage has lived a life that closely resembles that of an Indiana Jones thrill ride of an adventure. He has been healing the sick since at least four years of age. His grandmother, a Methodist faith healer, told him that if he laid hands on the sick, God would fix them. With childlike faith, he believed it, and it worked! His unique and powerful testimony includes having died and come back from the dead on four separate occasions. He has been run over by cars, tractors, & motorcycles. He has seen heaven and Jesus and been healed from it all. He enjoys equipping others and encouraging them to do the same thing as Jesus & greater. ​Patty has been healed of over 25 things to the glory of God. These include ADD, allergies, menopause, migraines; chronic back, neck, knee and joint pain; reading glasses, heel spurs, TMJ, carpal tunnel syndrome, hiatal hernia, and the list goes on. She has a special heart for pregnant woman, seeing them have healthy pregnancies and birth, the baby and mother healed and touched from the inside out. ​The Lord's House is a quiet place of worship and prayer. Elaine ministers through the gifts of the Holy Spirit by prayer. People from many nations have enjoyed restful peace in the home and have received inspiration and healing through worship and prayer. ​Pastor Corilee and her three daughters: Lana Snyders, Rebecca Boon and Amanda Boer, and Corilee's sister: Angie Johnson. Join us as we give all of the glory to Jesus our Lord and Savior!! Come and be ready to get your praise on!! Pastor Corilee, her sister, Angie, and her Mom and Dad have been singing in churches since they were just little girls.